Soul singer, songwriter, recording engineer, producer and learned music enthusiast Michaux (pronounced "me-show") is in the midst of launching an intimate and engaging new live music show called "MICHAUX TV." Inspired by Hall & Oates lead singer Daryl Hall's successful TV program "Live from Daryl's House," Austin, Texas-based "MICHAUX TV" presents a platform for living room-like live performance coupled with thoughtful conversation that flows very much like breaking bread over a stone soul kitchen table. 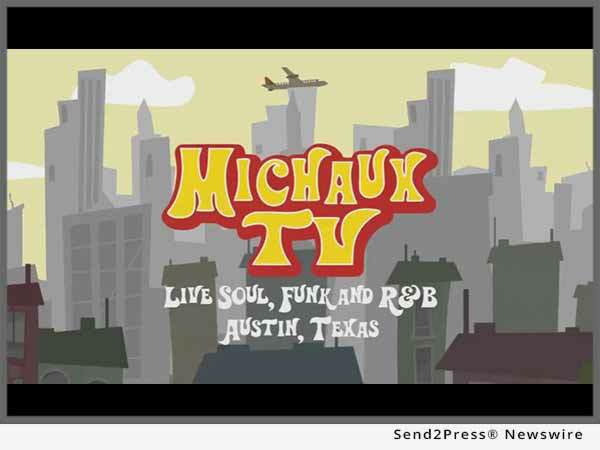 (AUSTIN, Texas) -- NEWS: Soul singer, songwriter, recording engineer, producer and learned music enthusiast Michaux (pronounced "me-show") is in the midst of launching an intimate and engaging new live music show called "MICHAUX TV." Inspired by Hall & Oates lead singer Daryl Hall's successful TV program "Live from Daryl's House" emanating out of Philadelphia, Austin, Texas-based "MICHAUX TV" presents a platform for living room-like live performance coupled with thoughtful conversation that flows very much like breaking bread over a stone soul kitchen table. "MICHAUX TV is a vibrant and much-needed artist showcase that shifts the focus of discovering new music from deceiving music videos and studio-tweaked tracks to real deal live presentation in a colorful throwback setting." -- A. Scott Galloway, Music Journalist; Album Liner Notes: Marvin Gaye, Curtis Mayfield, Bill Withers, Donny Hathaway. Every three weeks on Friday afternoons, "MICHAUX TV" features performances by Michaux and his band, as well as performances by a special guest ranging from local Austin sensations to unique musicians from around the globe. Also featuring lovely host/co-producer Arlana Clopton, the program educates as it entertains - always steeped in the authenticity and history of culture-rich Soul Music - past and present. When watching "MICHAUX TV," time stops and transports you back to the golden era of PBS-derived music shows such Ellis Haizlip's deeply missed "Soul," "Soundstage" and, to some kindred extent, "Austin City Limits." Austin-native Michaux is a "retro throwback authenticist" - a proud white soul singer obsessed and entrenched in the depth, sense of purpose and sensual vibrations of Soul Music at its '60s / '70s peak, laid down by masters such as Al Green, Curtis Mayfield and, his favorite, Marvin Gaye. Raised up in church singing in a soul-inspired style, Michaux has recorded two acclaimed CDs: his self-penned debut "Just MichauX" and his follow-up tribute to Gaye, "What's Going On ... Still ... " -- which Marvin's widow, Janis Gaye, highly praised as "an album done with respect, love, honor and integrity." That vibe also informs "MICHAUX TV." Michaux muses, "When Soul, Funk and R&B music came alive in the '60s and '70s, they transcended perceived racial and cultural divides, bringing people together through the power of the greatest music ever written, recorded and performed. Our goal is to perpetuate the original vibe of that music, and its messages of love, unity and harmony, with a fanatical focus on high quality video and sonics." "MICHAUX TV" is free to see from the comfort of your home on your computer or TV or on-the-go on your laptop, smart phone or tablet - any Internet video streaming device via YouTube or Facebook. Check http://www.michaux.tv/ for programming schedule, news and updates. Absolute Trust Talk: Tax Law Changes Impact Charitable Giving – Is Philanthropy Motivated by Tax Reasons Dead?